Please note: Your camp may have different requirements and/or limits than what is stated below. A. 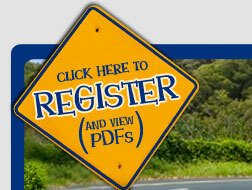 The easiest way to register for our service is to utilize our website. Click on the “Click Here to Register” sign in the upper right hand corner, enter your camp’s name in the search bar and click “Register Online”. You can also print out a form and mail it in with a check by clicking “View PDF”. Our office staff is always happy to help you as well at 970-949-0690. We do require payment at time of registration so be sure to have your Visa or Mastercard handy. Q. When will I be notified of the date of pick up? A. For those attending camp in June, you should expect to receive an email from us with your pick up date by the end of May. For those starting camp in July, you should expect to receive your pick up date via email by the end of June. Q. Why is there different pricing listed? A. We want to encourage our families to register early and avoid last minute changes. In order to provide you the best service, our mapping department needs to begin planning routes in early May. With late registrations or changes, they have to go in manually and change routes or add/remove trucks which can be very time consuming. We also need to know where we will be picking up in order to schedule pickup dates. Q. Can I put more than one child on a form? A. No, we require each camper to have their own reservation. This ensures proper pickup and delivery service for each child. Each reservation includes up to 2 pieces so you are able to distribute their items more evenly and avoid undue damage or overuse of your duffels. Q. What does "Based on Home Address" mean? A. Pricing is based on where Camp Trucking is picking up the bags or dropping them off. Do not select the state where your child's camp is located! Q. How do I know if I am shipping a Super-Sized Soft Trunk? A. Super Sized Soft Trunks or Ballistic Cargo bags are much larger than conventional duffels or soft-trunks. They typically measure over 42 inches long. Baggage suppliers tend to call these duffels: super-sized soft trunks, ballistic, cargo, or jumbo. If your duffel(s) happens to fit this description, please add an additional $35.00 per child to your price. Q. Can we insure the bags? A. We offer additional valuation coverage to protect against the total loss of your bags. This coverage is available for an additional $30 charge per camper and gives you up to $1000 per bag shipped in case of total loss due to fire or theft while in our possession. If you desire additional coverage, please contact your insurance carrier/agent as we do not sell insurance of any kind. Please note, the limit of liability for sports equipment is a maximum of $50.00. Q. Should I include directions to my home? A. Please do! Even if you were a customer in previous years, you will most likely have different drivers picking up or delivering at your home. Any special instructions or directions you can include to help locate your home are always appreciated. Please provide directions from the nearest main road or cross street; there is no need to provide directions from the highway. Q. Should I include the development name where my home is located? A. Yes. Please include the development name and any other special instructions we should be aware of such as a certain entrance we should use or restrictions for entry. Please note that if you do have a guard or gate, you must alert them to allow our drivers entry for your pickup and delivery ahead of time. If our drivers are denied entry and have to make a subsequent attempt, there may be an additional fee. Q. What happens if I discover that I need additional bags after I have registered? A. Please do not worry if you find you have more luggage than you anticipated. The best thing to do is just put it out with the rest of your child's luggage. Please make sure that all of your child's baggage has some sort of permanent ID attached to it. This should include your child's name, home address, and the camp he/she is attending. Do not include camp's address on this tag. Please call the Camp Trucking office or send a check for the additional bag to our office ASAP. You will need to include your child's name and camp, as well as, the reason for the check on the memo portion of your check. Fees for additional pieces of luggage can be found on the PDF and registration page for your camp. Q. What if I do not have enough baggage tags? A. If you realize that you do not have the correct number of baggage tags, please call our office at least 10 days before your pick-up date. However, if you realize that you do not have enough baggage tags and there is less than 10 days before your pick-up date, fear not, our drivers carry extra baggage tags with them on the truck. They will attach the appropriate baggage tag to that piece of luggage. Please do make sure that all your child's bags have a permanent ID attached to them (See above). Q. Do we need to call the Camp Trucking office to tell them we are sending additional baggage? A. Yes, you should notify us and send in the appropriate additional payment. However, if the additional baggage is last minute, the Camp Trucking driver will take all the luggage you have, and you will be billed accordingly. Q. What if we want to ship plastic drawers? A. Sure, as long as they are packed inside stiff shipping boxes. Remember, though, that those drawers aren’t made for travel. Plastic cracks easily and can’t support weight. Thus Camp Trucking is not responsible for plastic drawers/boxes that are damaged during transport. Q. Can we send golf clubs? A. Yes, you can. The cost is $50.00 to ship golf clubs round trip. Please make sure that the golf clubs are in a secure bag or box and are labeled with your camper’s information. Q. Can we ship our child's hockey/lacrosse stick? A.Yes. The price for a hockey stick and/or lacrosse stick is $40.00. Although not necessary, we strongly urge that hockey sticks/lacrosse sticks be packed in boxes. If your sticks are boxed you can use one price to ship multiple sticks in the same package. This will also ensure a more timely delivery, and there is less chance of damage. In addition, our luggage tags stay attached to boxes better than they do to sticks alone. Please label each stick and box in large print with child's name and camp name. If the items are not boxed, you MUST have permanent ID on the sticks that include the camper's name, CAMP name, and your home address. Please note that Camp Trucking is NOT RESPONSIBLE for any breakage to sports equipment. Our limits of liability on these items are $50.00 for each package shipped. Q. Can we send a bicycle? A. Yes. The bike must be boxed. Please see the back of your cover letter for pricing. PLEASE NOTE: Hockey sticks, roller blades, and other sports equipment need to be packed in appropriate containers. They cannot be strapped on to duffels or other baggage being shipped. This is to ensure that they will make it safely to-and-from camp. In addition, if you have questions regarding the safety of packing a piece of sports equipment in your child's baggage, please consider sending that item with your child in his/her carry-on luggage. This includes items such as tennis racquets. Camp Trucking will not be responsible for breakage or damage of such items packed inside a duffel bag or soft trunk. Above all, please note that Camp Trucking is NOT responsible for damage to sports equipment. Q. Do you provide boxes to ship our sports equipment/additional items? A. We do not provide any shipping materials or boxes. We recommend asking at a local sporting goods or shipping store. Remember, by utilizing a box to ship these items, you are welcome to ship multiple items in one box for one price. Q. What are the tags for, and where should we attach them? A. You should attach one luggage tag to each item you are shipping with us. It is extremely important that you PRINT the following on each tag: CAMPER’S NAME, ADDRESS, CITY, STATE, ZIP CODE, AND THE CAMP NAME that your child is attending. Please do not write the camp address on the tag. The address you use should be the return address for delivery in July or August. Q. What address should we write on the luggage tag if we are not using your service for return? A. Please write your home address on the luggage tags even if you are not using our return service. This will help to identify your bags while in our possession and at camp. Q. Can we just keep the old Camp Trucking tags on our bags? A. No, please REMOVE old tags and use the new ones provided. Our warehouse puts loading notes on the tags and this information changes yearly. By keeping old information on the bags, the risk of delay with shipment increases. Q. Should I put a lock on my child's baggage? A. Above all, please follow any suggestions or directions your child's camp has regarding this matter. We do ask that if you decide to put a lock on your child's luggage that you make sure that you have some form of permanent ID attached to your child's bags. While we do like you to use our baggage tags, they occasionally come off. If there is no permanent form of ID attached, we may need to open your child's bag if we have no other means of determining who the bag belongs to. Most parents do not lock their children's luggage. Q. What should we do if we have additional baggage to send with our camper last minute? A. Please ensure the bags are labeled with the following information: the camp name, your camper’s name, and return address (or home address). You can affix your own luggage tag or write this information in permanent marker on the bag. Upon pickup, our drivers will fill out and attach the appropriate Camp Trucking tags. A. Yes, you should notify us and provide additional payment. However, if the addition is last minute, the Camp Trucking drivers will take all of the items you have and you will be billed accordingly. Q. How do we set the pickup date? Can we change the date? A. Your luggage pickup date will be assigned to you based on which camp your child attends and the area we are picking up in. We work with your child’s camp to ensure the luggage is delivered before the campers arrive, usually about one week before camp begins. Therefore, please make a note of your pick-up date as we are unable to change the date. Remember, however, you do not have to be home for the pickup and we can pickup from a friend, family member or office if you prefer. Q. What should we do if no one will be home on the day of pick up? A. You do not need to be home for your pickup. Most of our parents simply leave the bags in a protected area around their home such as the front porch or a covered back deck. Please contact the Camp Trucking office with these instructions prior to the deadline for changes. If you unexpectedly need to leave home the day of pickup, simply leave a note on your front door informing the drivers where the luggage can be found around your home. Q. Can we have the bags picked up somewhere else such as a neighbor’s house or with a nearby friend? A. Yes, the baggage can be picked up from any address you choose. When you register, you can enter the address you would like the bags picked up from or if you have already registered and need to change the address, give our office a call before the change deadline. Be sure to let us know of any special instructions as soon as possible. Q. What time can we expect our camper’s baggage to be picked up? A. Our drivers begin their routes at 7 AM and continue until all bags are picked up on the day scheduled for your area, usually until the afternoon or early evening. Unfortunately as routes sometimes change last minute, as well as traffic and weather conditions, we are not able to provide specific time windows. * New York City Residents: We will pick up your luggage from your doorman or service entrance unless otherwise instructed. Luggage must be brought down the night before. If you live in a NON-doorman building or your doorman is not 24 hours, please be advised that our trucks begin pick-ups at 5:00 AM. Q. Why is there a deadline for changes and instructions? A. All changes and special instructions must be received by the Camp Trucking office far enough in advance, so that we can make the necessary adjustments to your records. This ensures that your home will be mapped into the appropriate service area and you receive the quality service you deserve. We cannot guarantee we will be able to accommodate changes made after the deadline and they may be assessed a $25.00 service fee. Q. Should we tip the Camp Trucking driver? A. Yes! Our drivers are hardworking college students. Tips are never expected, yet are greatly appreciated! Q. We want our return service to a different location, what should we do? A. If you need to change the address for return service, notify the Camp Trucking office and the camp prior to the July / August change-of-address deadline, so that we can change the tags to reflect your new return address. The luggage will be delivered to the address on the luggage tags. It is your responsibility to make sure that camp changes the tags to reflect the new return address. You must still call the Camp Trucking office, so that we can update our mapping records. Q. Can we have the bags delivered to someone else such as a neighbor or a nearby friend? A. Yes, the baggage can be delivered to any address you choose. All baggage will be scheduled and mapped for pick-up/drop-off based on the address you provide on the Camp Trucking application. The Camp Trucking office must be notified of changes by the change-of-address deadline, so that we can adjust your records accordingly to ensure you receive the best service possible. Q. What should we do if we have additional baggage to send with our camper? A. Please ensure the bags are labeled properly with your own baggage tags. This should include the camp name, camper's name, and home/return address. Your child's camp is also sent extra Camp Trucking luggage tags for these instances. Please make sure that the luggage is tagged with your return address on the tag. A. Yes, you should notify us and send in the appropriate additional payment. All baggage that is being shipped home must be pre-paid. Q. What should we do if no one will be home on the day of drop-off? A. If you cannot be home during the day of drop-off, do not worry. If you have specific instructions for where the bags should be left, please be sure to include those on your registration form or give our office a call prior to the change deadline. Our drivers are given the instructions you provided when you registered. Please note, once drop-off has been made, Camp Trucking will no longer assume responsibility for your baggage. Q. What time can we expect our camper's baggage to be picked up/dropped off? A. Our drivers begin their routes at 7 AM and continue until all bags are picked up on the day scheduled for your area, usually until the afternoon or early evening. Unfortunately as routes sometimes change last minute, as well as traffic and weather conditions, we are not able to provide specific time windows. * New York City Residents: We will deliver your luggage to your doorman or service entrance unless otherwise instructed. If you live in a NON-doorman building or your doorman is not 24 hours, please be advised that our trucks begin deliveries at 5:00 AM. Q. How will we know that the luggage was actually delivered? A. If your bags are not in plain sight, please look around your house. Our drivers are instructed to leave the bags in a safe area around your house. Please also check with your neighbor. A. Yes! Our drivers are hardworking college students. Tips are never expected, yet, they are greatly appreciated! Here are some suggestions and tips to help you and your child receive the best baggage service possible from Camp Trucking. 1. We suggest making sure that all your child's toiletries, especially those that might leak, are packed in a Ziploc bag. In addition, we suggest that you avoid those toiletries that have flip-top lids, as they are more likely to open if your child's bags get jostled. 2. Use common sense when packing your child's luggage. If your child has to bring his/her portable CD player, tennis racquets, or other item that might easily be damaged in a soft-sided piece of luggage then it might be wiser to send that item in the child's carry-on luggage. If that item needs to be transported in a piece of luggage, please take the time to make sure it is adequately protected by padding or other protective measure. 3. Be sure to remove your old Camp Trucking tags and use the new ones provided to you. If you did not receive new luggage tags via mail, give our office a call as we may be able to put another set in the mail for you. Our warehouse puts loading notes on the tags and this information changes year to year. By keeping old information on the bags, the risk of delay with shipment increases. Although it is not ideal, sometimes your child’s baggage can get separated during the shipping process. If this happens, you may receive your luggage in two different deliveries, on two different trucks. Please wait until the end of your delivery window for all your luggage to arrive. If you are still awaiting items at 6pm on your delivery date, give our office a call for more information. Please note that, similar to airlines, Camp Trucking will not be liable for normal wear to luggage associated with shipping or any luggage (especially oversized soft trunks and duffels) which has split at the seams or torn at the zipper. This is due to excessive contents. Please do not pack any breakable or valuable items such as cameras, phones, sports equipment, or other breakable items in the baggage being shipped home. Camp Trucking, Inc. will not be responsible for any such items that break in shipping; including plastic drawers. Please have the camper take breakable/valuable items on the bus or plane.